including Michel Tilmant, Chairman of the Executive Board of ING Group, the team announced its determination to return to the front of the F1 field in 2008, thanks to a combination of aggressive design concepts in the new car, and the talents of the sport’s only active double world champion, Fernando Alonso, allied to rookie Nelson Piquet. 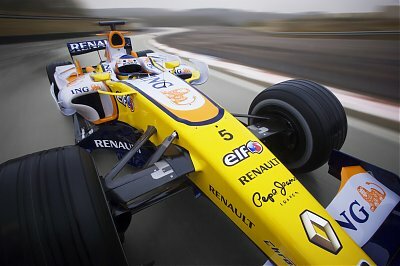 The ING Renault F1 Team’s hopes for the 2008 reason rest on the all-new Renault F1 R28. The car ran for the first time last week in Valencia, on Monday 21 January. During the four-day test, the car completed over 1500 km, indicating strong early reliability in spite of numerous changes to the 2008 technical regulations, including the introduction of the Standard ECU and long-life gearboxes. The team also made encouraging progress with set-up and performance development, allowing the car’s debut to be judged as promising. The new car represents a shift in design philosophy from its predecessor, in order to extract optimum performance from the Bridgestone tyres that all competitors have used since the start of 2007. The new car features revised weight distribution and a new aerodynamic concept to match, which has been enabled by the introduction of a “zero-keel” front suspension mounting. The monocoque and bodywork to improve the packaging of the car’s mechanical systems while under the skin, the SECU and new gearbox represent the biggest changes. As with all new designs, the team has worked hard to improve stiffness and remove weight throughout the car, to provide maximum set-up adjustability from circuit to circuit. The car will once again be powered by the RS27 V8 engine, which remains substantially the same as last year’s unit, given the engine homologation rules currently in force. Engine ancillaries must be homologated by the first race of the year, while the team has also had a heavy workload adapting to the demands of the SECU. 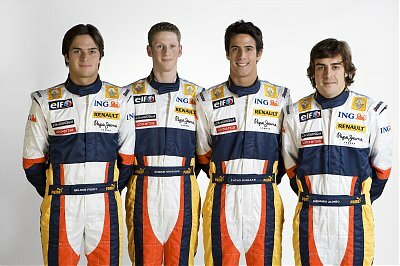 The ING Renault F1 Team’s race drivers for 2008 will be double world champion Fernando Alonso and rookie Nelson Piquet. Alonso returns ‘home’ to the team where he won his two world titles after a sabbatical season with rivals McLaren-Mercedes, and has already reacclimatised to life at Renault. He has tested twice with the team this month, setting fastest time at the recent Jerez test with the old R27, before beginning the initial on-track development of the R28 last week in Valencia. The Spaniard scored 15 of his 19 career wins with Renault, and is the only man to have finished in the world championship top three over the past three seasons. Nelson Piquet will partner Alonso in his debut Formula 1 season, as another famous name returns to the sport. While Nelsinho may carry a famous name, he is determined to make his own mark in F1, and to build on the experience he gained last year as test driver for the ING Renault F1 Team. The 2006 GP2 series runner-up was also the youngest ever British F3 champion during his junior career, and the 22 year old Brazilian will now look to confirm his potential at the highest level. The race driver pairing will be aided in their test and development work by third driver Lucas di Grassi, runner-up in the 2007 GP2 series championship, and test driver Romain Grosjean, who will also compete in the 2008 GP2 series with ART Grand Prix. 23 year old Brazilian di Grassi will conduct the majority of the team’s development work alongside Fernando and Nelsinho, while Grosjean will get his first taste of F1 at a number of tests during the year. The 21 year old Swiss-born Frenchman has already made a flying start to his season in GP2, taking a double victory in the opening rounds of the GP2 Asia championship last weekend. 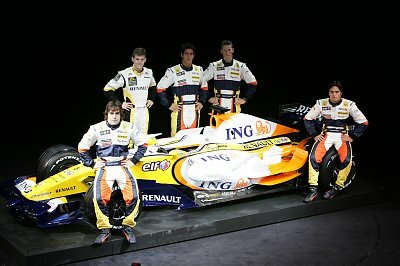 The ING Renault F1 Team enters the 2008 season in rude health, following substantial technology investments by Renault SA during 2007 and the acquisition of new commercial partners for 2008. The CFD centre of excellence is currently under construction at Enstone, and will be operational by the second half of 2008. The facility will provide cutting-edge development resources for the team and also for the development of more efficient road cars in future Renault ranges. Coupled to a stable technical team with a proven track record, the outlook for the new season is positive.